Three years in the making, I am delighted to announce the completion and availability of my PhD thesis, which offers the most in-depth study yet of the Transition concept in practice. It can now be ordered here. 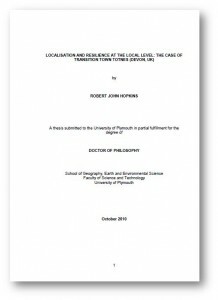 Exhaustively referenced and comprehensive in its analysis of the thinking underpinning Transition and of its impacts in practice (running to over 90,000 words), ‘Localisation and Resilience’ is a pivotal addition to the literature on this fast-growing response to peak oil and climate change. It takes as its focus the Devon town of Totnes, the UK’s first Transition initiative, looking in detail, using interviews, oral history, focus groups, surveys, World Cafe and Open Space methods, at the impact Transition Town Totnes has had during its four year existence. It also takes a detailed look at the literature on resilience, and argues that the combination of resilience thinking, localisation and social enterprise offer a powerful tool for the economic revival of communities and for achieving a low carbon economy. If you are interested in resilience, sustainability, Transition, and the future of local economies, this is an essential new publication. Owing to its size (475 pages) and to printing costs, it is being made available only in PDF format (3.7MB) which will be sent out by email. Some tasters from this thesis have already been posted here at Transition Culture, such as Local Food and Relocalisation, and Localism or Localisation?. More will be posted over the coming weeks. Personally speaking, I am delighted to have completed it, and even more delighted to be able to make it available, as I think it is something that explores Transition in a depth which people will find really useful. I tried very hard to write something un-dusty and un-overacademic, and had a wonderful compliment the other day, when a local historian who had contributed to it, told me that he was two-thirds of the way through the book and that he found it ‘rivetting’. Not many PhDs out there that find themselves attached to that particular adjective. “This thesis provides a critical review of the Transition movement, a grassroots response to peak oil and climate change, co-founded by this author. It focuses on two key aspects of the Transition approach, resilience and economic relocalisation, with the aim of analysing whether and how they can be implemented in a locality based on the Transition approach, and assessing what socio-economic and community-related structures would be necessary to implement such a process. The focus of the research is Totnes, Devon, which because of its status as the UK’s first Transition initiative and the longer history of various initiatives to promote local resilience, offers a valuable case study of attempts to practically implement resilience and localisation. A variety of research methods were employed, including surveys, focus groups, oral history and in-depth interviews, as well less conventional public participation methods such as Open Space and World Café. The first major finding was that Transition Town Totnes (TTT) has become a significant organisation in the town, with a high level of popular support. It was also found that the obstacles to resilience and relocalisation lie not, as was hypothesised, in a lack of skills or an absence of community cohesion, but in issues of governance and the need for increased social entrepreneurship. It was found that what researchers call the ‘Value Action Gap’ (i.e. the gap between people’s declared sympathies and intentions and their actions) exists in Totnes as much as anywhere else, but that some of TTT’s projects, such as Transition Together, are working imaginatively to overcome this and to reduce emissions. From this evidence is it concluded that Transition’s approach towards relocalisation and reducing carbon emissions can be argued to be effective in, generating engagement and initiating new enterprises. Like other ‘green’ initiatives, it struggles to engage those from more disadvantaged backgrounds, but some of its initiatives are showing promise for overcoming this. Its primary contribution is in suggesting a redefining of resilience, not as a state of preparedness for disaster, but as a desired characteristic of a sustainable society. A more resilient community, it is argued, would be one more in control of its food and energy production, as well as being one that enables inward financial investment. It also argues that the government focus on ‘localism’, the devolving of political power to the local level, ought to be expanded to include ‘localisation’, the strengthening of local production to meet local needs, a shift which would financially benefit local communities. It argues that the key challenge for Transition initiatives such as TTT is going to be scaling up from being ‘niche’ organisations to become economically viable organisations with a broad appeal and engagement, and also articulates the need for ‘Resilience Indicators’ which would allow communities to measure the degree to which their levels of resilience are increasing”. I’ve been doing presentations lately for higher and higher-ups in Vermont’s eco and political communities, and blowing the Transition Trumpet all along the way. Thanks for both the tools and the inspiration. Can’t wait to read your thesis. Congratulations — a wondeful achievement! Bravo, well done Rob ! Thank you SO MUCH from all of us ! Congratulations Rob and well done. Thanks for your inspiration and hard work.